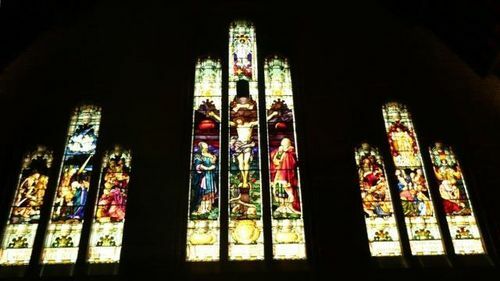 The Saint Andrew`s War Memorial Window titled "The Crucifixion" commemorates those who died in service or were killed in action during World War One. The window was donated by William Robert Black and dedicated in August 1922 on the occasion of the diamond jubilee of the church. The impressive diamond jubilee celebrations of St. Andrew's Presbyterian Church and the solemn ceremony of unveiling memorials were participated in by congregations which crowded the church yesterday. The national flag of historic interest which draped the memorial windows, and the graceful palms, the ferns, and arum lilies with which the altar was adorned, gave increased beauty to the stately edifice. Turning then to the central window, covered with two huge Union Jacks, Dr. Merrington said:-"The members of the families of St. Andrew's who in the spirit of the Cross responded to the nation's call, together with their other gallant comrades in arms, and who fell on many a far-flung field with their faces to the golden East, have left behind them a spirit, a memory, and an example which shall never pass away. They have won a deathless name. These have deserved well of this congregation as well as of the Commonwealth, the Empire, and humanity." The Union Jacks were then lowered gracefully from the large three-panelled window. The "Last Post" was sounded by sergeant-buglers, accompanied by a drummer in Highland costume, while the congregation remained standing facing the windows. The dedicatory prayer was then offered. The Brisbane Courier (Qld), 7 August 1922.